In 1995 I came across a gorgeous book by English author Lorrie Mack, The Art of Home Conversion: Transforming Uncommon Properties into Stylish Homes (Cassell, 1993). It’s a compilation of stories about homes created from structures as diverse as a flour mill, water tower, stables, various types of factories and shops, and several less uncommon yet equally breathtaking churches and barns. The buildings themselves were amazing, but most compelling to me was a piece of furniture—a hallstand shot through a doorway in the entrance to a former fruit and vegetable shop. A vision in aged oak and beaten copper, it married gothic and Golders Green. I hoped I’d have a chance to make one like it someday. In 2002, during a slow patch in the shop, I bought a curly white oak log from a local sawyer and built a version of the hallstand modified for contemporary use. A feature about the piece was published in Fine Woodworking. 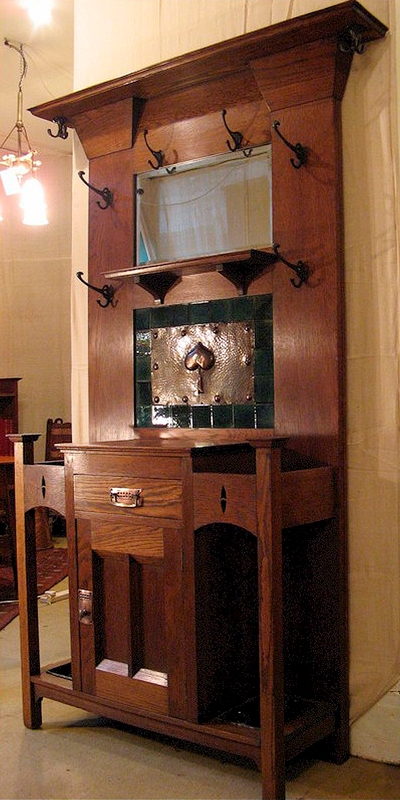 Eventually I sold the hallstand to a pair of English professors who had the perfect space for it in the entryway of their Tudor Revival home. A few years later, while visiting an acquaintance who had amassed an enviable collection of Arts and Crafts furnishings and decorative objects, I fell in love with a breathtaking sideboard. Would he mind if I made a reproduction? Business being slow (translation: being effectively broke), I made my version using plain sawn red oak—a lot more affordable than fancy quarter sawn white. (The original had not been made of quarter sawn either, though its old-growth brown oak was far more elegant than my fat-ringed red.) Instead of copper panels I used art glass with copper foil, and I had door and drawer pulls fabricated by a local sculptor. The dealer who’d sold the sideboard was under the impression that it had been made for Liberty. The piece itself had no identifiable maker’s mark. But the owner’s curiosity was piqued by my interest, and he made some inquiries that revealed the sideboard had been produced by a company called Harris Lebus. You can read all about this in the Summer 2010 issue of American Bungalow magazine. But what you won’t find there is the tale of coincidence that follows. I had never tried to identify the original hallstand’s maker. There wasn’t so much as a hint in Lorrie Mack’s book. After my article appeared in Fine Woodworking, a reader had contacted me to say she owned one of the original hallstands, but she said nothing about who had made it. Now that I thought about it, there were some strong similarities between the hallstand’s architecture and that of the sideboard. I wished I could contact that reader, but her message and email address had been lost in a laptop fatality. American Bungalow agreed to publish a story about Harris Lebus. My former employer, Roy (“It’s all problems”), a longtime friend, generously offered to pay my airfare and put me up in his home near London so I could do some further research. In the limited time available I visited the Bruce Castle Museum, whose staff were extremely helpful in providing photocopied documents, including an informal history of the Lebus company written by a family member; walked with Lebus researcher Paul Collier around the Ferry Lane Estate, site of Lebus’s Tottenham works; found some excellent leads at the Geffrye Museum in Hackney; and pored through many packets of late-nineteenth- and early-twentieth-century catalogs and other documents at the Westminster Archive. I would later follow up these leads with further research into genealogy and the turn-of-the-century context in which Lebus operated. Though identifying the hallstand’s maker was not an official goal of the research trip, I was hoping to satisfy my curiosity. Surely in all these documents I would come across a picture of the hallstand. But I didn’t. One day, while using a public computer at a visitors’ center in Kingston, I typed in yet another search for “arts and crafts hallstand,” just for the hell of it. This time, unaccountably, I found what I was looking for. The hallstand had indeed been a Lebus product. It was a thrilling discovery. At that point I had made only five major spec pieces in a cabinetmaking career spanning 28 years. What were the odds that two of those five should turn out to have been based on original pieces made by the same British manufacturer—one whose name I hadn’t even heard of before finding its wares so lovely that I wanted to make my own versions?